I would like to congratulate Athens Academy on 50 years of excellence in education. This wonderful milestone signifies the enduring strength of this outstanding institution and the exceptional learning environment Athens Academy provides for its students. On September 5, 1967, Athens Academy opened its doors for the very first time with 147 students and twelve faculty members on a dairy farm at the corner of Hawthorne Avenue and old Jefferson Road. The vision of our founders, as was articulated in our original charter, was to establish a school for students from "diverse social, economic, religious, and racial backgrounds who can benefit from a rigorous academic program led by a highly qualified and enthusiastic faculty." In 1972, we moved to the current campus on Spartan Lane, and what a journey it has been. Thank you to all who have been a part of this community, helping to make us what we are today. We hope you will take a moment to think about our school and the bright future we have ahead of us. We are a school family of over 2,500 alumni, 150 current faculty, and many hundreds who came before us, and we have a lot to celebrate as a community on this special day. Thank you for all you have done to make our school such a special place for our students, past, present and in the future. 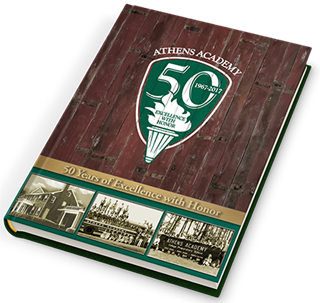 This beautiful hardbound coffee-table book tells the story of Athens Academy’s first 50 years, from the early years on Jefferson Road up through today. Filled with hundreds of photos, it is an important keepsake for current families, alumni, faculty, grandparents, trustees—anyone who has been a part of one of Athens’ most important and influential institutions. Click here to order online or purchase at the Spirit Store.